Jim Hudson Automotive Group has been serving the South Carolina midlands since 1980, and we are dedicated to 100% customer satisfaction in every facet of our business. Whether you're purchasing a new or pre-owned vehicle, servicing one you already own, or shopping for parts, we work hard to provide a World Class experience at all seven of our Jim Hudson locations. Visit us in Augusta, Columbia, Lexington, or Irmo, SC today! Jim Hudson Automotive Group is proud to sell and represent seven of the industry's top brands -- Ford, Toyota, Lexus, Audi, Cadillac, Buick and GMC. Our goal is to find the vehicle that's right for you and your budget, to make the car buying experience more streamlined and enjoyable, and to assist long after the sale with high-quality service departments and certified personnel. That commitment to quality doesn't stop with new vehicles, though. We also carry a vast selection of used and certified pre-owned vehicles of all makes and models. Each of these vehicles is inspected and reconditioned with care, so you can feel confident when you shop hundreds of used cars and trucks on one of our lots or online. Our finance departments offer competitive rates, and we are happy to help in situations with bad credit or first ownership. Are you a military veteran, on active duty, or family of active military? We honor and support our military in every possible way, and we readily offer discounts to our military customers at every Jim Hudson dealership. We thank you for choosing Jim Hudson Automotive Group, and we hope to see you soon for a chance to show what makes our dealerships different. Experience it once, and you'll never forget it! Jim Hudson, founder and principal of Jim Hudson Automotive Group, was presented with the Order of the Palmetto by Gov. Nikki R. Haley. “On behalf of the people of South Carolina, I am pleased to award Jim Hudson the Order of the Palmetto – our state’s highest civilian honor. This award is in recognition of his extraordinary work and dedication to the citizens of our state,” says Gov. Haley. Hudson is one of a select group of 49 dealer nominees from across the country who were honored at the 100th annual National Automobile Dealers Association (NADA) Convention & Exposition in New Orleans, Louisiana. 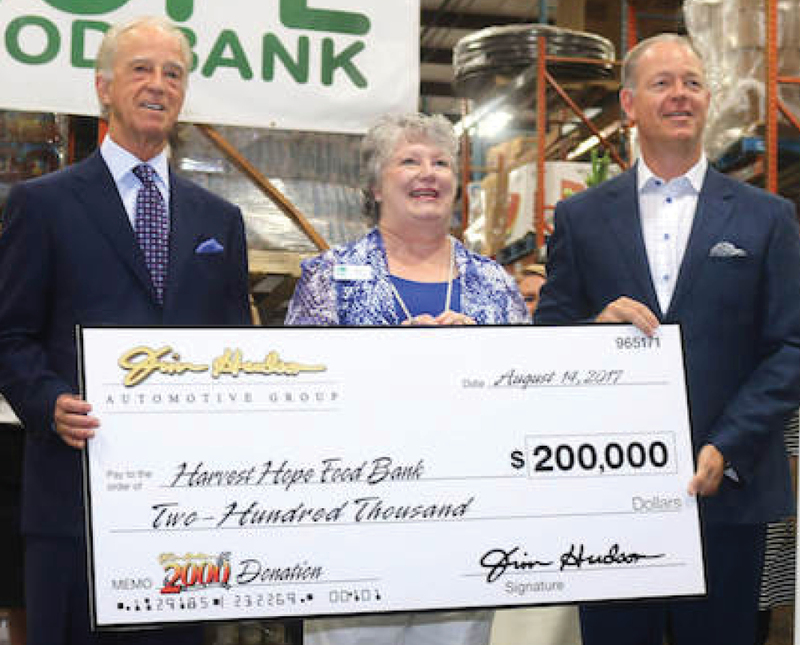 Every year, the Jim Hudson Automotive Group holds a sales race to sell 2000 vehicles and raise $100,000 to benefit Harvest Hope Food Bank. 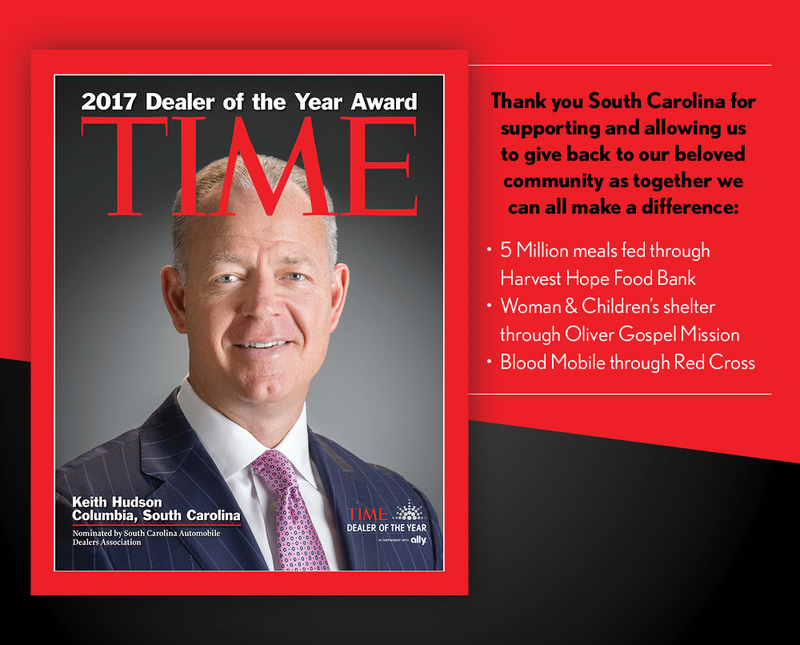 This year, we managed to contribute even more by donating $200,000 to feed 1 MILLION less fortunate people here in the Midlands, and we couldn't have done it without the commitment of our employees, friends, families, and most importantly, our loyal customers. Thank you for helping make the Jim Hudson 2000 Sales Race such an immense success for our community!